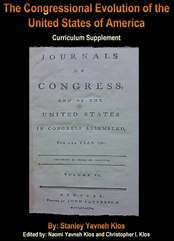 DUNLAP, John, printer, born in Strabane, Ireland, in 1747; died in Philadelphia, Pennsylvania, 27 November, 1812. While a boy he went to live with an uncle, William Dunlap, a printer and publisher in Philadelphia, at the age of eighteen entered the business, and in November, 177I. began the publication of the "Pennsylvania Packet." 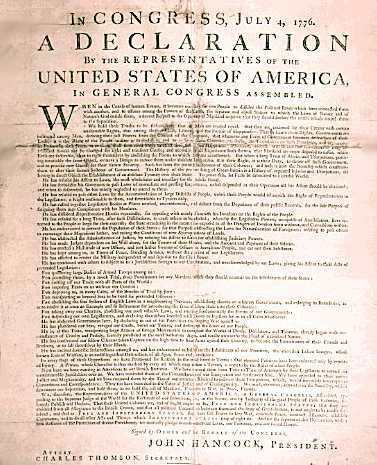 This paper was changed into a daily in 1784, the first in the United States, and afterward became the "North American and United States Gazette." It was July 1776. Fighting between the American colonists and the British forces had been going on for nearly a year. The Continental Congress had been meeting since June, wrestling with the question of independence. Finally, late in the afternoon on July 4th, 1776 twelve of the thirteen colonies reached agreement to declare the new states as a free and independent nation. New York was the lone holdout. That evening John Hancock ordered Philadelphia printer John Dunlap to print broadside copies of the agreed-upon declaration that was signed by him as President and Charles Thomson as Secretary. John Dunlap is thought to have printed 200 Broadsides that July 4th evening which were distributed to the members of Congress. Note: Today their are only 25 of these broadsides that are known to exist. 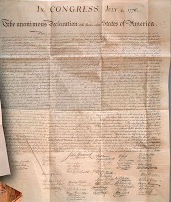 The original Declaration of Independence that was signed by John Hancock and Charles Thomson on July 4, 1776 is lost. A Dunlap broadside - unsigned, as it is known, recently sold for $8.14 million, the highest price ever achieved for an object sold at an Internet auction. This copy was discovered in 1989 by a man browsing in a flea market who purchased a painting for four dollars because he was interested in the frame. Concealed in the backing of the frame was an Original Dunlap Broadside of the Declaration of Independence. The other copies of the Dunlap broadside known to exist are dispersed among American and British institutions and private owners. The following are the current locations of the copies. Start your search on John Dunlap.